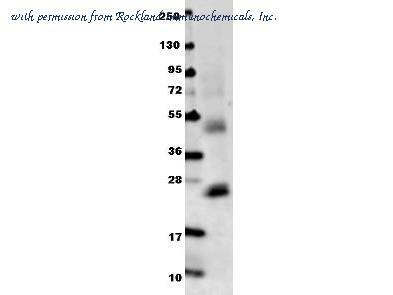 The IL-6 antibody from Proteintech is a rabbit polyclonal antibody to a fusion protein of human IL-6. This antibody recognizes human,mouse antigen. 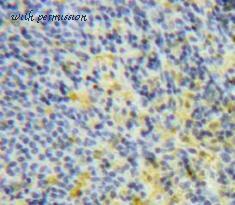 The IL-6 antibody has been validated for the following applications: ELISA, IHC, WB analysis. 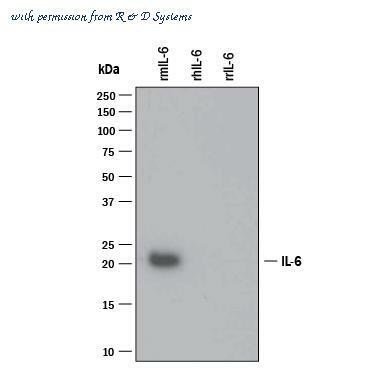 Detection of Recombinant Mouse IL-6 by Western Blot. Western blot shows 25 ng of Recombinant Mouse IL-6 (Catalog # 406-ML ), Recombinant Human IL-6 (Catalog # 206-IL ) and Recombinant Rat IL-6 (Catalog # 506-RL ). PVDF Membrane was probed with 1 ╡g/mL of Rat Anti-Mouse IL-6 Monoclonal Antibody (Catalog # MAB406) followed by HRP-conjugated Anti-Mouse IgG Secondary Antibody (Catalog # HAF007 ). A specific band was detected for IL-6 at approximately 18 kDa (as indicated). This experiment was conducted under reducing conditions and using Immunoblot Buffer Group 3 . Detection of Mouse IL-6 by Western Blot. Western blot shows lysates of RAW 264.7 mouse monocyte/macrophage cell line untreated (-) or treated (+) with LPS. PVDF membrane was probed with 0.5 ╡g/mL of Goat Anti-Mouse IL-6 Antigen Affinity-purified Polyclonal Antibody (Catalog # AF-406-NA) followed by HRP-conjugated Anti-Goat IgG Secondary Antibody (Catalog # HAF017 ). A specific band was detected for IL-6 at approximately 22 kDa (as indicated). This experiment was conducted under reducing conditions and using Immunoblot Buffer Group 1 . Immunohistochemistry-Paraffin: IL-6 Antibody [NB600-1131] - IHC staining of IL6 in human bladder cancer using DAB with hematoxylin counterstain. 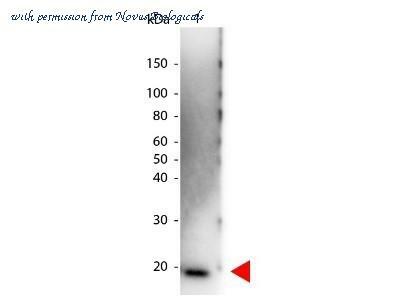 Western Blot: IL-6 Antibody [NB600-1131] - Analysis using the HRP conjugate of NB600-1131. Detection of Lane 1: Human IL-6. Detection of Lane 2: none. Load: 50 ug per lane. Primary antibody: none. 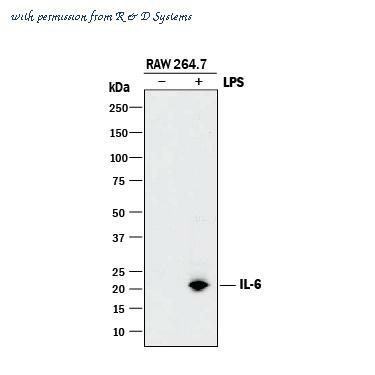 Secondary antibody: Peroxidase Human IL-6 secondary antibody at 1:1,000 for 60 min at RT. Block: MB-070 for 30 min at RT. Predicted/Observed size: 20 kDa for Human IL-6. Western Blot: IL-6 Antibody [NB600-1131] - Protein was resolved on a 4-20% Tris-Glycine gel by SDS-PAGE and transferred onto nitrocellulose. 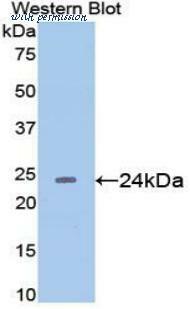 The blot shows detection of a band 21 kDa in size corresponding to anti-IL6 antibody. Molecular weight markers are also shown (MW). After transfer, the membrane was blocked for 30 minutes with 1% BSA-TBST. Detection occurred using peroxidase conjugated anti-Rabbit IgG secondary antibody diluted 1:40,000 in blocking buffer for 30 min at RT followed by reaction with FemtoMax chemiluminescent substrate. Western blot analysis of mouse spleen tissue using IL6 antibody. 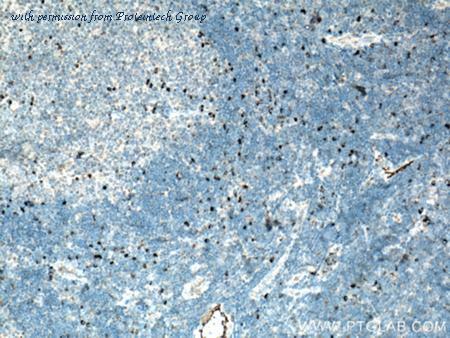 Immunohistochemical analysis of formalin-fixed paraffin embedded rat lung tissue using IL6 antibody. Western blot of recombinant IL6. This image was taken for the unconjugated form of this product. Other forms have not been tested. 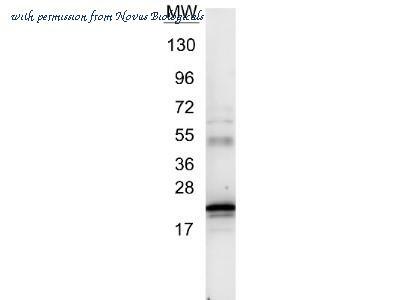 Anti-mouse IL-6 antibody in western blot shows detection of recombinant mouse IL-6 raised in E.coli. Recombinant truncated protein (0.1 µg, 21.7 kDa) was loaded on to an SDS-PAGE gel, and after separation, transferred to nitrocellulose. The membrane was blocked with 1% BSA in TBST for 30 min at RT, followed by incubation with Rockland's Anti-Mouse IL-6 antibody diluted 1:1,000 in 1% BSA in TBST overnight at 4°C. After washes, the blot was reacted with secondary antibody Dylight™ 649 Conjugated Anti-Rabbit IgG (H&L) (Goat) Antibody (611-143-122) diluted 1:20,000 in blocking buffer (p/n MB-070) for 30 min. at RT. Data was collected using Bio-Rad VersaDoc® 4000 MP imaging system.